I 'm Gelah Penn. I was born in a small town in western Pennsylvania. After receiving a BFA in painting from the San Francisco Art Institute, I moved to New York City, where I have lived for many years. I have a part-time day job in the communications department of a child welfare agency. 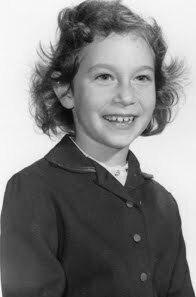 Portrait of Gelah Penn at the age of eight. 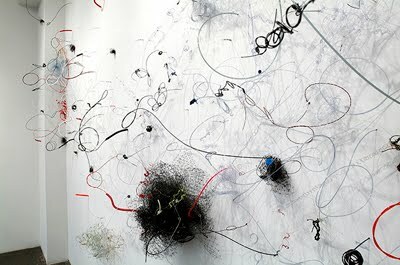 My work explores mark-making in sculptural space. In largely temporal, site-specific installations, I expand on the vocabulary of gestural abstraction by deploying linear, synthetic materials to construct a kind of meaty ephemerality—an accretion of marks and their shadows generating visual noise. Gelah Penn, The Naked Kiss, dimensions variable, Mixed mediums*, 2009. 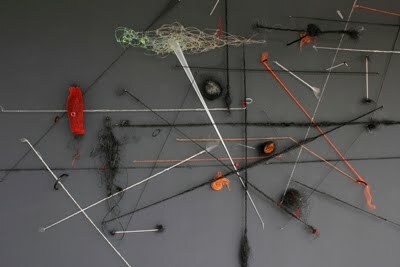 Gelah Penn, (Detail) The Naked Kiss, dimensions variable, Mixed mediums*, 2009. * NOTE: Mixed mediums may include: monofilament, mosquito netting, plastic and copper mesh, rubber and vinyl tubing, vinyl lanyard, Dacron line, plastic, felt dots, upholstery needles, rubber ball, ear plugs, and t-pins. 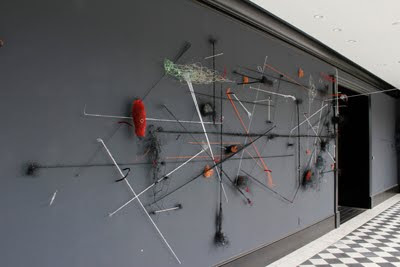 eliminated underlying structures completely and began to use only the wall as my armature. I have worked in installation since the late 1990s. 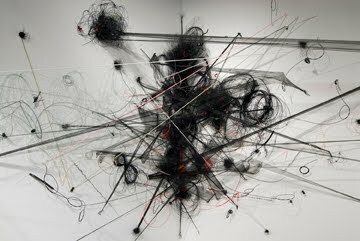 Gelah Penn, Shadow of a Doubt, dimensions variable, Mixed mediums, 2010. At Carl Berg Projects, Los Angeles, CA. Photo courtesy of the artist and Carl Berg Projects. Ambivalence is a major character trait of mine, so I’m quite comfortable in the spaces between drawing, painting and sculpture. I moved away from painting because I needed to give gesture physicality. 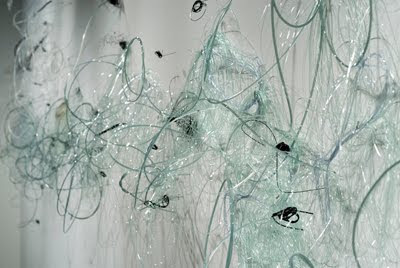 My intention is to dematerialize sculptural form and give substance to two-dimensional line. 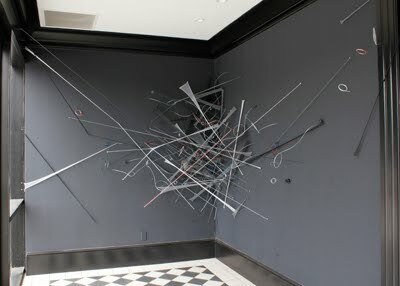 I think I was drawn to installation because I have a strong sense of territory, and making these works allows me to interpret and define a given space. There is something quasi-cinematic and literary about the form, and that speaks to my great interest in film and fiction. There is no conventional narrative in the work, but there is a sense of tension, chaos, anxiety and naughty bits. Gelah Penn, (Detail) Shadow of a Doubt, dimensions variable, Mixed mediums, 2010. I’m drawn to all manner of detritus; the kinds of things that get caught and swept along, e.g., dust in corners; flotsam in tornadoes; motes in the air, in the brain, in flux. I’m interested in the complexities of visual commotion and welcome the viewer going in and out of focus looking at my work. The profusion of gestures may sometimes be disconcerting, but I hope also engaging. 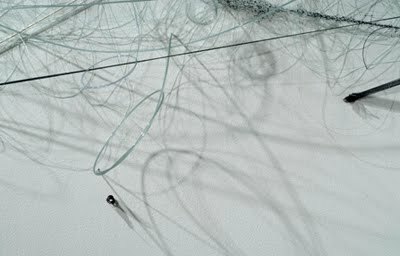 My attraction to monofilament as a primary material is due to the way it reflects and absorbs light and because I can essentially draw with it. I’ve gotten to know how to work with its natural inclinations and that has become almost a collaborative process. To some extent, it dictates what the piece will be. A new piece begins with a site visit. I take photographs and then embark on casual, ruminative sketches in which ideas begin to percolate. 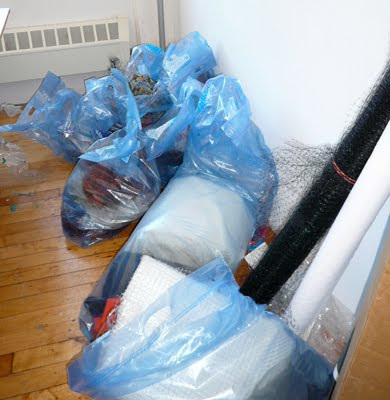 At that point, I work up passages in my studio with a stash of materials that I keep in giant ziplock bags, as well as some components that I’ve pre-fabricated (I do a lot of knotting in the evening while scanning old movies). This rough draft (since the way I work is somewhat performative, it could also be called a “rehearsal”) is taken down and some segments are rolled up in large plastic tarps. I then box up a ton of materials that I might need—I always take far more than I ever actually use. The real work begins on site—an intense, risky and anxiety-ridden process that involves much improvisation. It’s a bit like working without a net. I don’t have assistants—there are too many decisions that need to be made while installing, and I haven’t figured out a way to use help without it becoming a distraction. Installation time varies, depending on the architectural parameters of the space and complexity of the piece. 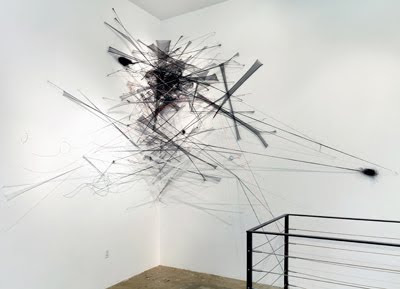 Gelah Penn, Suddenly, dimensions variable, Mixed mediums, 2010. 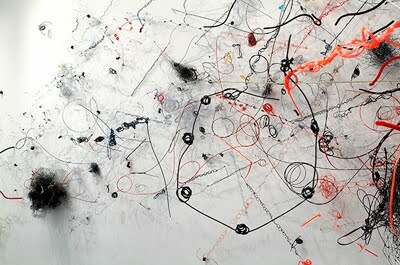 Gelah Penn, (Detail) Suddenly, dimensions variable, Mixed mediums, 2010. When installing, I am not on auto-pilot. Ideas and decisions are generated in the making of the work. 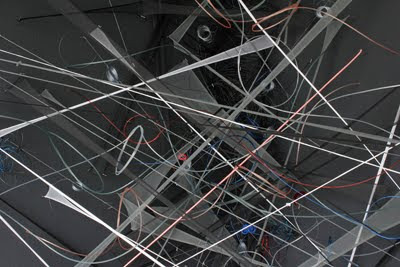 Each installation provokes a question or problem that I respond to and work through in succeeding installations. 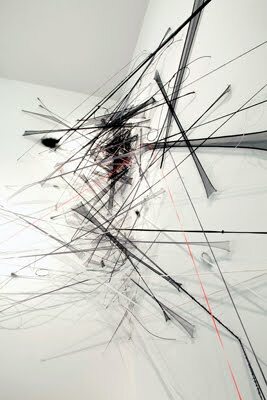 Gelah Penn, (Detail) Clash by Night, dimensions variable, Mixed mediums, 2009. I like working with oppositions: transparent/opaque, calm/chaotic, fluid/choppy, lyrical/nasty. 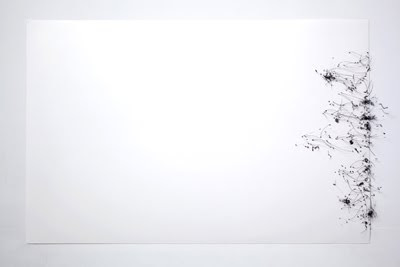 Stretched and taut lines suggest spatial planes. Shadows are all important in inducing a feeling of perceptual dislocation. 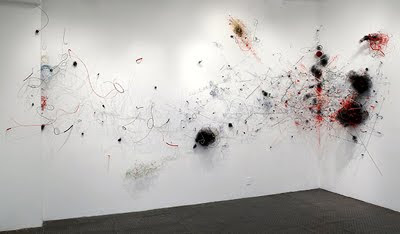 Gelah Penn, Clash by Night, dimensions variable, Mixed mediums, 2009. In addition to installation, I also work copiously on paper. 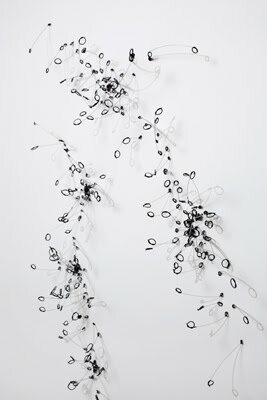 In a recent series of monofilament relief works, “Blackfil,” I limit my materials to gray or clear monofilament and black acrylic paint. This enables me to focus more keenly on the gestures themselves and build layers of real and faux shadows. 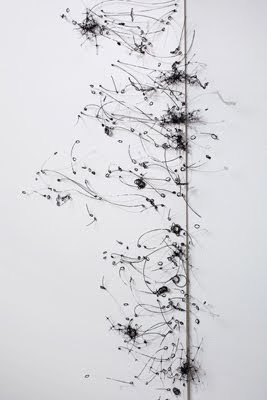 With Yupo (a synthetic paper) as my armature, I thread monofilament in gnarled configurations across the paper’s surface to create expanses of peripatetic mark-making: psychic sutures. 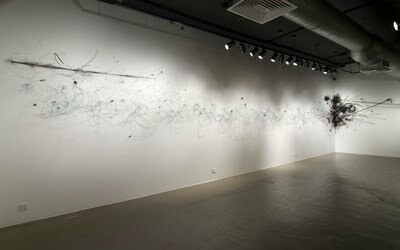 As with the installations, I encourage the viewer to read these pieces beginning anywhere they wish, and to engage with the work’s visual cacophony. My influences are many: Goya, Turner, Giacometti, Henri Michaux, Cy Twombly, Lynda Benglis, Alan Saret, Judy Pfaff, Sarah Sze, and films, especially film-noir and 1950s melodramas. The titles of the installations are taken from film noir, underscoring the psychological undertow of the work. 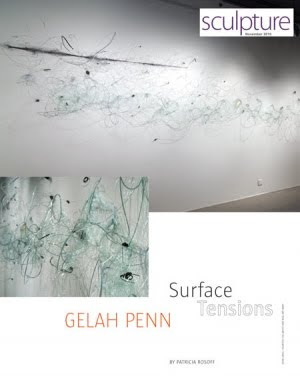 Gelah Penn: Surface Tensions, Sculpture Magazine, November 2010. 11/2/2010. 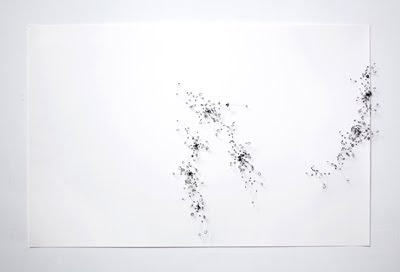 Recent exhibitions include Carl Berg Projects in Los Angeles and Allegra LaViola Gallery in New York City. A feature on my work is in the November issue of Sculpture Magazine and I am currently a recipient of a Marie Walsh Sharpe Foundation/The Space Program award for 2010/2011. Your readers may contact me at gelah@earthlink.net. My website is located at www.gelahpenn.com. I do not currently have gallery representation. Commissions are welcome. Sand T Kalloch. The information on this blog site may be out of date. 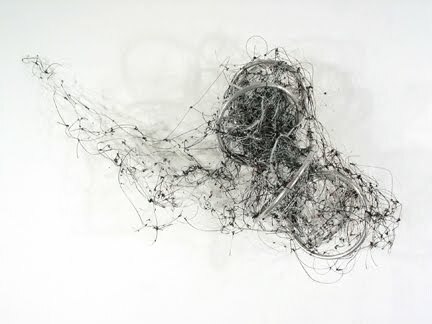 "Featured Artist: Nikki Rosato" was the FINAL interview published by MAKING THE ART SEEN on January 22, 2012. MAKING THE ART SEEN is a non-commercial virtual gallery featuring art interviews. Artwork is not sold through the site nor does it exclusively represent the artists featured. Created by artSPACE@16 ONLINE in April 2009, the primary goal of this new initiative is to provide an artistic web presence within the virtual community. Potential gallerists and/or art collectors will contact the artist directly regarding exhibition opportunities and/or purchasing artwork. Enjoy reading and getting to know the artists! 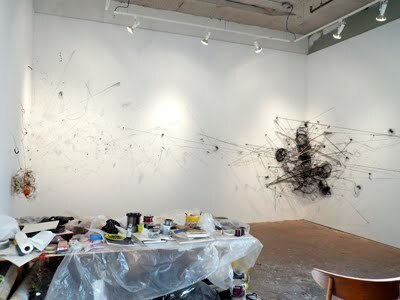 Established as S.T Gallery (in Boston Fort Point Channel) in October 1998; re-built as artSPACE@16 Gallery (in Malden, Massachusetts) in July 2000. After nearly a decade of operation, artSPACE@16's physical gallery space closed for good as of June 1, 2008. artSPACE@16 continued to advocate for the arts on the world wide web under a new name "artSPACE@16 ONLINE" through December 2014. MAKING THE ART SEEN, artMATTERS e-Blast, Networking Hub, Massachusetts Open Studios, Artist Live/work space, artSPACE@16 Exhibition Archives + ART COLLABORATIVES were some of the art resources provided by artSPACE@16 ONLINE to serve the arts community. © Copyright MAKING THE ART SEEN artSPACE@16 ONLINE Gallery.